Swansea City vs. Chelsea : 13 April 2014. 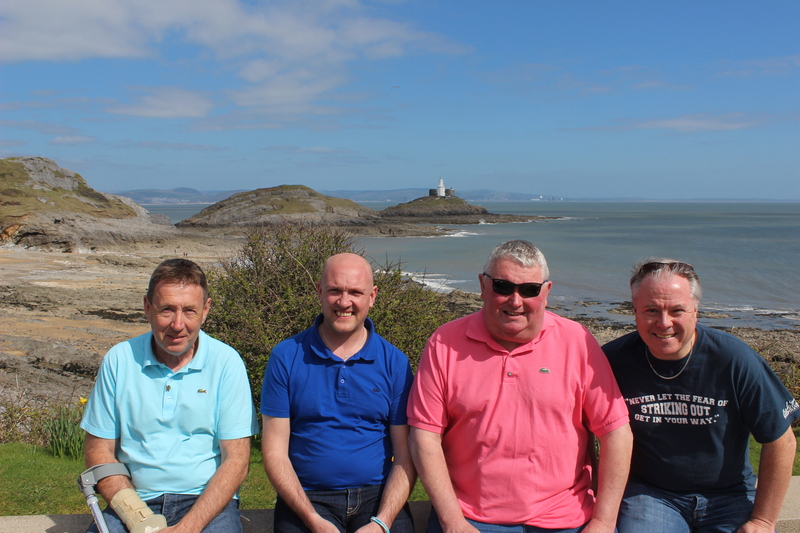 So there we were; the four of us, basking in the early-afternoon sun at Bracelet Bay, just south of The Mumbles on the Gower Peninsular. We had just enjoyed a fine lunch at the Castellamare restaurant – where Parky and I enjoyed a similar pre-game meal before the January 2012 game – and were just about to head back into town to join the rest of the supporters for the Swansea City vs. Chelsea game. It had been a fine trip thus far. Due to the – relative – close proximity of the Liberty Stadium to my home (110 miles in case anyone is wondering) and the relatively “newness” of this venue, this always was going to be one of the most anticipated away days of 2013-2014. The four of us were having a blast, in fact. The story of how the trip came about is an interesting one. Until about a week before the game, Parky wasn’t going to be attending this game. Although he is a Chelsea season ticket holder, he had missed out in the application process. This was a real shame. We had enjoyed our first league game in Wales for 28 years on that trip in 2012 and were keen to repeat it. I was hopeful that a ticket might somehow become available from a Chelsea mate, but I also had a back-up plan. I work in logistics and one of our suppliers is based in Swansea. About a month ago, after we learned of Parky’s cruel twist of fate, I enquired if they could possibly muster up one ticket from somewhere. After a couple of subtle hints, the dialogue dwindled. I wasn’t too hopeful. Then, out of the blue, I received the great news that not one but two tickets had been acquired. Not only that, they were gratis…free…complimentaries. This was a result of the highest order. I quickly ‘phoned His Parkyness to tell him; he was, as the old cliché goes, “over the moon Brian.” I quickly decided that Parky would have my ticket, alongside Alan and Gary in the away section, while I would make use of one of the complimentaries. Who would get the other one? It was an easy decision. 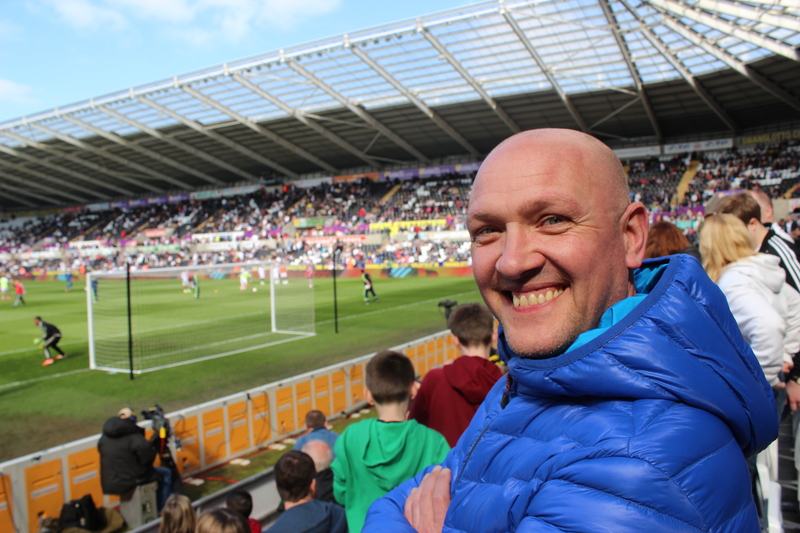 My good friend – in fact, my oldest Chelsea friend by a good few years – Glenn was free on Sunday 13 April and so he unsurprisingly jumped at the chance to travel with me to Swansea for the game. Glenn has been keeping an extra special eye on my ailing mother of late and so here was a lovely way to reward him for his time, not that a reward was being sought of course. It was just nice that he was free, that we could watch the game together. Originally, I had visions of us schmoozing in a corporate area, but I found out on the Wednesday that the two tickets were located within the home end. This wasn’t a problem. The tickets – two season tickets – were posted to me and arrived on the Friday. This was coming together rather well. I longed for the weekend. It was, quite possibly, going to be the best weekend of the year so far. On the Friday, I saw iconic punk poet John Cooper Clarke in my home town with a few old (non-Chelsea, gasp) friends and on Saturday I awaited the arrival in town of a Chelsea friend from afar. I first met The Bobster in Palo Alto in 2007, ahead of our game against Club America on a perfect Californian summer day, and we have become very good mates during the intervening period. Bob has travelled over to England on around six or seven occasions since then – plus away games in Rome and Paris – and has even travelled down to my home town in Somerset to see my local team play. Bob had this trip booked, in that meticulous way of his, some months ago. There was always going to be a trip to Frome on the day before the jaunt to Swansea, and Parky was always going to be accompanying us, regardless of match ticket. Additionally, there was always going to be a boozy rendezvous around the pubs of Frome (aka “Dodge City”) too. What made it all the more enjoyable was the sudden news about the extra two tickets. Four of us were going to South Wales and it was going to be a cracker. I followed up the night out on the Friday with a well-planned pub crawl around Dodge on the Saturday. I invited two local Chelsea stalwarts – PD and Brian – to join Glenn, Bob and I and the evening’s entertainment began at PD’s local “The Crown.” I had warned Bob that this pub would be as “old school” as they came. The linoleum on the floor and the – ahem – minimalistic décor proved my point. Bob’s enquiry if the pub served food was met by a quick rebuttal from me. We assembled just after 7pm, but were saddened to see Wigan squander a 1-0 lead and to end up losing their F.A. Cup semi-final against Arsenal. The drinks went down well. It was lovely to be out in my local town with four other Chelsea supporters. We felt untouchable. Glenn and I ended up at an “80’s Night”, where the drinking continued, and where – in one surreal moment – we found ourselves up on stage dancing to Tiffany’s “I Think We’re Alone Now.” It was a good night. Thankfully, I awoke the next day hangover-free. Glenn didn’t fare quite so well. I had collected The Bobster outside his hotel in Frome’s Market Place at 9.15am and I called for Glenn soon after. To be honest, I was just thankful that he was in the land of the living. However, on a day when our behaviour in among the home fans would probably be under intense scrutiny (“who are those two, by there?) – and heaven knows we had joked about us putting on Welsh accents, and growing moustaches, to blend in – I was taken aback by Glenn’s choice of puffa jacket. He had a royal blue Quiksilver polo, too. We swung over to collect His Lordship. A quick breakfast at McMelksham (“look at those two twats with their Arsenal shirts on”) and then up onto the M4. It was a splendid day. The weather was superb. As we rose on a hill to the north of Bristol, we could easily see the hills of Wales on the horizon. The view was exceptional. I drove over the new (well, circa 1997) Severn Bridge and we were soon in Wales. Bob was soon chuckling at the dual road signs on show as I thundered past Newport, then Cardiff, then Bridgend, then Port Talbot. In a little more than two hours after leaving Parky’s Wiltshire village, I had parked-up outside the Swansea train station to allow Bob to deposit his overnight bag in the Grand Hotel opposite. A few Chelsea faces were already drinking in the hotel bar – I paid it a visit last season in fact, during the dying embers of Roberto di Matteo’s tumultuous reign. Parky didn’t accompany me on that trip. Both of the league games at the Liberty Stadium ended as 1-1 draws. As for the League Cup semi-final (which none of us attended), the less said the better. So, three visits to Swansea and three draws. On the trip, little was said about the up-coming match. I have sensed that there is a shifting of focus by Chelsea supporters from the domestic league towards European glory. Although I was hopeful of a Chelsea win later that evening, and with it a continued presence in the crazy and unpredictable title race, I was surely not alone in thinking that our league campaign might end with most Chelsea fans focussing on Madrid and Lisbon. This, to be honest, was unlike me. I have always counted league glory over European glory. And yet…and yet…Munich gave me the best night of my life and the best weekend of my life. How could I not want a second European Cup? These are heady days. For an hour or so, the four of us chatted over lunch. Glenn’s hangover had subsided, but Bob gave us all headaches when he informed us that Manchester City had let in two early goals at Anfield. In that moment, had the power shifted towards the city of Liverpool? As I drove slowly back into the city, we were given a sightseeing tour by Parky. He had been so smitten by The Mumbles on our visit in 2012 that he had soon returned back with his far-better half Jill for a few days. As I passed through The Mumbles, Parky spoke of that visit. It seemed that there were few pubs that Jill and Parky hadn’t frequented. Then, mayhem. The news came through that David Silva had not only scored once but twice at Anfield. When the second one was announced on Five Live, we roared. My car may have shifted a few lanes. Suddenly, in Swansea, with the terraced houses clinging to the surrounding hillsides, and the sky so blue, we were back in it. Then, just after the stadium came into view…utter dismay. Liverpool 3 Manchester City 2. I parked up and we sauntered down to the neat stadium, the sun warming the Welsh air. Outside, I said my goodbyes to The Bobster. He walked with Parky up to the northern end of the stadium, while Glenn and I headed to the other end. After a few paces, I spotted a Swansea face; one of the wannabee hooligans featured in that laughable documentary about an ill-fated trip to Notts County game a few years ago. Inside, we had great seats. We were in only the fifth row in the lower tier, just yards from the goal. Around us, of course, were natives. We spoke in hushed tones. I have watched games in home areas before of course; Liverpool, Arsenal, Everton, Blackburn Rovers, Bristol Rovers, Bournemouth, Bristol City to name a few. I have never encountered any trouble. However, this game was a little different. I was using someone else’s season ticket; it was likely that we would soon be sussed. We vowed, therefore, to randomly cheer the odd Swansea move, but – obviously – stay silent should Chelsea score. I also didn’t want the kind benefactor to be reprimanded by the club for letting in away fans. The Chelsea end slowly filled-up. I spotted Bob, Alan and Gary. This was going to be a weird sensation for me. For once, I would be the outsider looking in. There were a few flags. 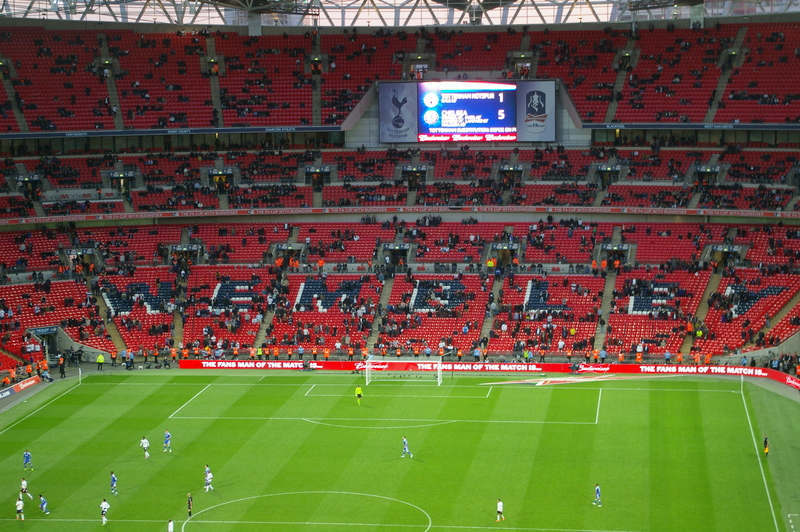 But quite a few empty seats. The teams entered the pitch and the hitherto quiet home sections were roused. We remembered the ninety-six Liverpool fans, including one lad from Swansea, who tragically perished twenty-five years ago. The game, however, changed when Chico Flores was booked twice within a few minutes. Swansea were down to ten men. The home fans were incandescent with rage. We seemed to have all of the possession then, but never looked like getting behind their back-line. A few chances were exchanged, with Salah and Willian heavily involved. When Andre Schurrle was booked, the Swansea fans cheered and clapped. I joined in. It had been a strange game. Our play was slow and I wondered what magic might issue forth from Jose Mourinho’s mouth at the interval. At the break, two changes – Oscar for Ramires and Eto’o for Schurrle. We were now on the offensive and Oscar was very involved. We stepped up the pressure, moving things nicely in the Swansea half. A Ba header was flicked wide. Then, with Eto’o just yards from goal and centrally placed, he shanked it wide. I silently sighed. Then, a shot from Ba. The chances were mounting up. And so did the team. Only a timely block from John Terry denied Routledge. The clock was ticking and I again wondered if we would ever score. Would our league title challenge end with a whimper in Wales? A quick throw in by Dave found an unmarked Matic. This was poor defending by Swansea, but their ten men had chased us down for an hour. They were starting to tire. Matic wasted no time in toe-poking the ball up-field to Demba Ba. Our number 19 adeptly brought the ball down. He edged left and shot early. Vorm could only deflect the ball in. I remained silent and still. Two thousand Chelsea fans were doing the celebrating for me. It was a great, immediate, bellow of noise. By then, many of the home fans around us had already left. The final whistle blew. Our foray behind enemy lines had been a huge success. However, it had been an odd game. We had enjoyed tons of possession, and had peppered the home goal with a multitude of shots, but it was all much laboured. But let’s be honest, at this stage of this very strange season, all we can attempt to do is win. Job – most definitely – done. Queens Park Rangers vs. Chelsea : 15 September 2012. At last. At long last another Chelsea game. A whole three weeks had passed since I attended our fine win over Newcastle United. Thankfully, I didn’t venture to the south of France for the Super Cup game. Yes, three whole weeks. Twenty-one days. It felt like an extra close-season. And I hated every minute of it. It was a sunny morning in deepest Somerset as I slotted my coffee mug into the drink holder alongside my car seat. I flicked the ignition on; I was back on the treadmill. Japan’s “Quiet Life” reverberated through the speakers and I was on my way. I texted the briefest of messages to Alan in London. I was on the road once more. With no detour north to collect Lord Porkinson on this occasion, I was soon driving through Frome, past Warminster and then up and over Salisbury Plain. It was soon clear that it was going to be a cracking day. The sun was up, the sky was blue, it’s beautiful and so are you. On the long straight before I dipped into the miniscule village of Chitterne, the view ahead made me smile. Hay bales were stacked in the fields to my left and right. It was a perfect scene of rural England. It was a perfect day for football. And then it came back into my mind once again. I’m sure that there were many fans that set off for Sheffield on that sunny day in 1989 that had a similar outlook; a sunny day and a perfect day for football. My mind had been full of thoughts about Hillsborough since the news of the enquiry into the disaster came through on Wednesday. Without much prompting, my original thoughts on those events came rocketing back. And I recoiled at the memories. The recollections from that day in April 1989 are still surprisingly clear. 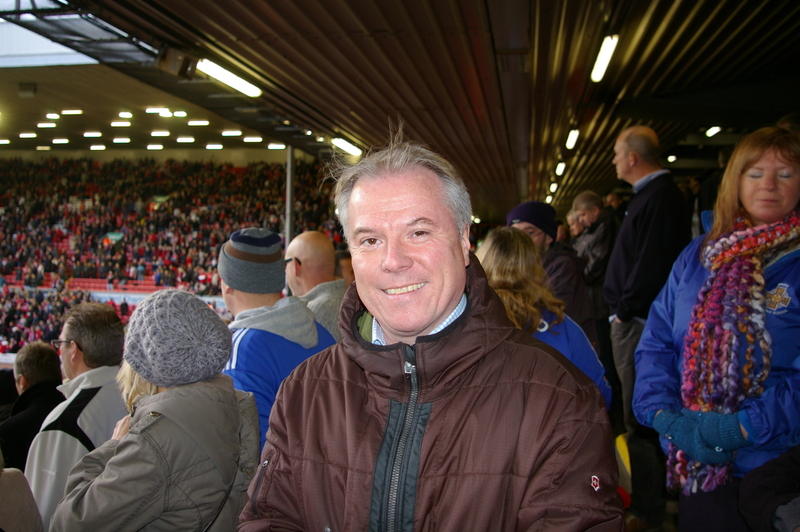 On the previous Saturday, I had travelled by train to see our enjoyable 3-2 win at West Brom. As I was saving hard for my first-ever trip to North America throughout the 1988-1989 season, I had decided to save some money and not travel to Filbert Street for our game with Leicester City. I remember that it was the day that we could have been promoted and many Chelsea travelled to the game. Instead, I was at home. I remember I was sat at the table, pen in hand, attempting to put further meat on the bones of my skeletal planning of my US trip. I had a few brochures strewn over the table and the radio was on. The commentary game on BBC Radio Two was from Hillsborough and there had already been mention of a little crowd disturbance. This surprised me; there was no “previous” between the two teams as far as I was aware. If anything, there was a general easing off from the, dare I say it, hooligan hay days of the early ‘eighties. We had the second summer of love in the UK in 1988 and there was a tendency for hooligans to start a slow drift away from decaying football terraces and into nightclubs, warehouses and fields as a drug called ecstasy took hold. After just six minutes, the game was stopped and I was bemused. I couldn’t work out why there was any trouble in Sheffield. As news of the events unravelled, I soon realised that the BBC would have TV cameras at the game. I turned the radio off. I turned the TV on. Within a few moments of watching the scenes of confusion at the Leppings Lane end of the stadium, the news came through that several Liverpool supporters had died. I was in shock. I can solemnly say that the news chilled me to the core. The travel brochures were brushed aside as I watched with a mixture of sadness, horror and disbelief as the afternoon turned into a scene of devastation. The rest of the day is a blur. Chelsea lost 2-0 at Leicester and it didn’t matter. Pat Nevin scored for Everton in the other semi-final and it didn’t matter. To be honest, not much mattered that evening. Football wore a black armband the following few weeks; the events cast a deep shadow over us all. Our next game was on the following Saturday and the fates contrived for a massive game at Stamford Bridge; Chelsea vs. Leeds United. Not only a game against our old rivals from West Yorkshire, but the game which could see us promoted. I met up with three college mates – Ian, Bob and Trev. Ian was a Rotherham fan, but Bob and Ian were Leeds. We had a few pre-match pints in The Black Bull alongside my Chelsea mates Alan and Paul. We spoke in earnest about Hillsborough. By then, the death toll was a massive ninety-five (*it became 96 in 1993 when Tony Bland’s life support machine was turned off. Bland was the only victim with whom I had a link. He worked for the same company that I did between 1991 and 1998 ). The over-riding feeling throughout the talk was that “it could have been us.” I had watched Chelsea from the Leppings Lane enclosure in 1985. We had all experienced moments on terraces where the crush had been slightly scary. From what I remember, there was a muted atmosphere in and around the stadium. The attendance was only 30,000; under normal circumstances, I would have expected more. There was a well observed minute’s silence before the game. A John Bumstead goal gave us a 1-0 win, but it was a weird day. There wasn’t the euphoria of the 5-0 win over Leeds which got us promoted in 1984. This was a far different feeling. After the game, Bob, Trev, Ian and I had a few pints at Earls Court and then in central London. We ended up in one of my favourite boozers – “The Round Table” near Covent Garden. Talk was still dominated by Hillsborough. I remember I said to Bob “in a way, we’re all responsible” and he wanted me to explain myself. Every violent song, every violent gesture helped stir the atmosphere at games and the language of hate was never far away in those days. And although I had never been in involved in football violence, I – like many – enjoyed the banter and badinage that went with football hooliganism in that era. It was part of the scene, part of the culture, part of football. There had even been moments when I had shouted “go on Chelsea” as it kicked off at a game. We had all been ambivalent to it. But Hillsborough was an eye-opener for me and a few of us. It made me question myself and the part I had played, however miniscule, in the erecting of those fences at Hillsborough which had, ultimately, caused the death of ninety-six football fans. And it really could have been me. If Hillsborough hadn’t happened in 1989, it may have happened at Highbury in 1990, Old Trafford in 1991 or Stamford Bridge in 1992. I can well remember a game at Chelsea in 1988. We played Charlton Athletic in a real relegation dogfight. My parents arrived late and, intending to get seat tickets, were forced to sit on a part of the crumbling Shed terrace which had been sectioned off as unsafe under the Safety of Sports Grounds Act. Thankfully, only around three hundred were sat on this terrace, but the point is that Chelsea Football Club broke all the rules about crowd safety that day. They were lucky nobody was hurt. They were also lucky that nobody was hurt when the same thing happened against Middlesbrough a few weeks later. My photos from that day show the central part of The Shed heavily over-populated to the point of danger. Big John, who sits near me at HQ, posted on Facebook on Thursday about Hillsborough. He mentioned that in that game against Leeds United in 1989, the spectators raised £15,000 for the Hillsborough disaster fund. In today’s climate, today’s money, today’s 41,000 full house, that equates to around £75,000. I think this evidence illustrates that most football fans’ view back in 1989 was of sadness and solidarity with the Liverpool fans. Since then, there is no doubt that perceptions have changed, presumably triggered by our on-going unhealthy spat with Liverpool Football Club. Blame Luis Garcia, blame “that” song about history. However, my own view – though not widely expressed – has always been that the emergency services were to blame for the deaths of the ninety six in 1989. I certainly never believed those scurrilous lies which were peddled by The Sun newspaper, but which became “fact” as the years passed, about fans stealing from the dead and urinating on the police. I never joined in. It always felt so wrong. For the reasons mentioned, I’m not a fan of the “Chelsea – hooligans” chant either. There is, however, one black mark against Liverpool Football Club. It was always seen as the “done thing” amongst their support (and more so than any other team’s fan base) to try to “jib in” – or find a way to get in without paying, sometimes by the most ingenious ways – and this is one part of the Hillsborough tragedy that they have been shamefully quiet about. Not even I could have expected such an exoneration of the Liverpool fans, not even I could have expected the scale of the cover-up by the emergency services and the government alike. I found it quite incomprehensible that Hillsborough, seen at the time to be one of the best stadia in the country, did not have a valid safety certificate at the time of the game on 15 April 1989. For this, the Football Association and Sheffield Wednesday should be held accountable. I learned this week that each of the pens at the Leppings Lane end was fitted with small gates at the front, which were locked. When the crush started to occur, a simple unlocking of those gates would have eased the pressure on those fans at the front and the disaster could have been averted. I’d suggest that the keys to those gates were not within easy reach of anyone at Hillsborough. I’d even suggest that nobody even knew where those keys were kept. While the Liverpool supporters ferried the injured and the dead away from the pitch, using advertising hoardings as impromptu stretchers, a line of policemen – with Alsatian dogs – stood across the entire width of the pitch. They were there to stop the Liverpool and Forest fans – in their eyes – from fighting each other. The past week has been a sobering time. It has provided me with a very sombre reminder of how we, as football fans, were regarded back in the late ‘eighties. And it was too important topic for me not to mention. I quickly uttered a “FFS” to myself and turned it off. After the events of Hillsborough this past week, it seemed ludicrous that a handshake was getting so much attention. Although we were playing at Loftus Road, I first had an appointment at Stamford Bridge. I quickly trotted down to the little shop outside the main forecourt and collected a couple of photographs of myself – smiling like a fool – with the twin trophies from last May. I aim to frame one of them along with a couple of photographs from Munich and the ten match tickets that are evidence of my attendance throughout last season’s maniacal assault on the Champions League trophy. I also purchased the double-disc DVD of the same Champions League campaign. As I stepped out into the surprisingly warm September sun, the players’ coach slowly drive past. I tried to peer in, but the windows were tinted. I just stood there, smiling, again like a fool. When it comes to Chelsea, there will always be part of me that is an awestruck eight year old at my first ever game. I returned to my car and it only took me fifteen minutes to reach my familiar parking spot off Askew Road. It even surprised me how quick I was able to traverse the borough; from Stamford Bridge to Loftus Road in a heartbeat. If there had been no traffic, I expect I could have driven it in around eight minutes flat. I spotted a few QPR fans in their hooped shirts, but there was no over-riding feeling that there was a “big match” in the vicinity. Loftus Road now barely holds 18,000. Our biggest ever game at this compact stadium took place during the march to the 1970 F.A. Cup Final when around 30,000 attended. No doubt the streets would have been swarming with fans on that particular day. In 2012, there was a hush around the immediate environs. We had read on the internet that the Rangers fans were aiming to recreate “hell” for our visit. I dipped into a cosy café for a bite to eat. There were a few home supporters there too. I didn’t let on I was Chelsea; why would I? There were no negative comments about us, nor no reason to believe that they regarded us as the beasts with horns that sections of their support would have us believe. Talk was of QPR players, past and present, their recent form and general football chat. I was soon outside the entrance to the away end. I spotted the habitually morose Zac (“I’m still worried about the manager, Chris”) and then the cheerier Long Tall Pete and Liz. I didn’t fancy bringing my “proper” camera to this game; with the heightened frisson between our clubs, I didn’t want an overly keen steward to stop me entering the ground with my long lens. Instead, I opted for my small “pub camera.” I took a few shots of the cramped approach into the stands, all corrugated iron and narrow passageways, and then had a quick chat with the contingent from Bristol who I often speak about. We all agreed that the gap between games was unwanted. It felt – it really did – like the first game of the season again. 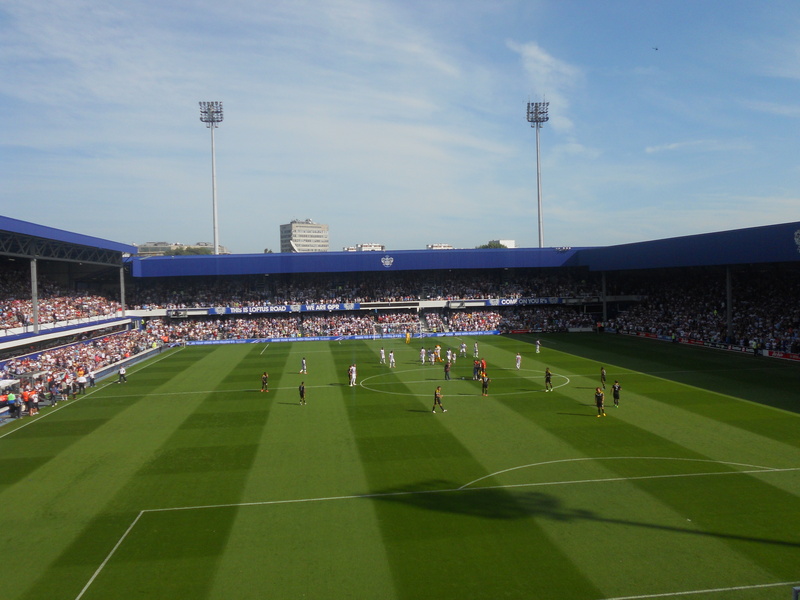 The School End at Loftus Road – or Rangers Stadium as they like to call it – houses the away support in two tiers. The upper tier is only thirteen rows deep. The lower tier possibly smaller. The seats are cramped. The Loft at the other end is larger, but only slightly. It took a while for the place to fill up. To my left, there were a few empty seats in both tiers of the main stand. I spotted the idiot with the sombrero; we all remembered him from last season. To my right, the dark shadows of the single tier stand, home to some of the QPR’s more boisterous support. Sure, Rangers were formed as long ago as 1882. They have played at a large variety of locations in west London, but only at Loftus Road since 1917. The deep corrugated fascia on the stand roofs appeared to have been given a lick of paint over the summer; a darker blue, a royal blue. To be fair, Loftus is a neat stadium, but oh-so small. Alan and Gary arrived with five minutes to spare. We stood the entire game. I only slouched into my seat at half-time when I gave my feet a rest. The teams were announced and then we awaited the arrival of the teams on the pitch. With a blink of an eye, the teams had lined up and the pre-game ceremonies took place. I squinted to see what Anton Ferdinand decided to do, but – to be truthful – nobody could tell. The Chelsea players were warmly applauded by the loyal 2,500 in the School End. Three songs dominated the day. After the coin toss, the teams changed ends and so we were treated to Anton Ferdinand sprinting deep into his half, all by himself, to within a few yards of the Chelsea fans in the corner. He turned to acknowledge the home fans but – of course – his intentions were clear; to wind up the away fans, to maybe illicit some abusive reactions, to maybe get a Chelsea fan arrested. According to Alan, he did exactly the same in the home game last season. A lad next to me had to be reassured that, yes, the QPR goalkeeper was indeed Julio Cesar, the same Julio Cesar who had stood between the posts for Internazionale of Milan. There are strange things happening on Planet Football these days and no transfer is weirder than that. From 80,000 screaming Milanese to 18,000 dreaming West Londoners. It mirrors the absurd move, some thirty years ago, of Allan Simonsen from Barcelona of the Primera Liga to Charlton Athletic of the second division. In truth, it was a poor game. I thought that Fernando Torres began brightly and seemed to be full of confidence. Little things; the confident touch as the ball was played to him, the step-over, the impudent flick, the consummate ease with which he spun a ball out to the wing with the outside of his foot. This was promising stuff. An early passage of play found Eden Hazard bearing down on the goal down below me. The shot was at the ‘keeper and the save drew groans from us. Then, Torres did well to turn inside the box under pressure, but his shot was weak. And then the referee played his part. I thought that a high foot on Ashley Cole, inside the box, warranted a penalty, but the play wasn’t even halted. Andre Marriner then annoyed us all when he called a foul back when we were breaking through with the ball. Then a free-kick and John Terry ended up on the floor. Then a delicate run by Eden Hazard deep into the box and a tangle with Shaun Wright-Phillips. I didn’t get a clear view, but the appeal by my fellow School Enders was loud and sincere. The sun was casting clear shadows on the green rectangle below. Above the tall spindles of the floodlight pylons at the Loft End, jet flumes were creating patterns in the sky. Down below, the huff and puff of a typical London derby was producing few clear chances, few passages of entertaining play. Long Tall Pete, a few rows in front, agreed. After the initial flurry of songs in support of both teams, the atmosphere was pretty lame. An illustration of how low Chelsea really regards QPR is that no mention was made of our 6-1 win against them last Spring. It was all frustrating stuff from us. Fernando Torres, all alone at the pinnacle of our 2-3-1, was hardly given any service. When he did have the ball at his feet, his tendency was to dribble through the defence single-handedly. He was clearly getting frustrated. On more than one occasion, Marriner did not see fit to give a free-kick in his favour. Elsewhere, our method of play was oh-so familiar…pass, pass, pass. I am one of Mikel’s supporters, but his tendency for a back-pass was winding me up. His most annoying trait is not looking up to see his options available before receiving the ball. His mind is often made up. And it’s usually to pass back to JT or Luiz. I’m sure that if Mikel is ever asked to take part in a penalty shoot-out, he will pass the ball back. However, our own players were hardly shining. JT – typically – was solid, but most other players were struggling. Frank looked tired. Ramires was drawing a few negative comments too. For most of the second period, things were dire. Two late chances gave us ample opportunity to scramble a win, but wayward shots from Hazard and then Lampard blazed over the bar. It was one of those days. It was clearly one of those games. There was palpable dismay as we sloped out of the ground. The home fans were chirpy, the Chelsea fans were less so. I suppose that the pragmatic view is that we didn’t lose, we didn’t concede, we are still top of the table. Obviously, Juventus on Wednesday will be far more of a test. I’m sure I speak for many when I say that I can’t wait to hear that Champions League anthem once again. Chelsea vs. Liverpool : 5 May 2012. During the preceding week, I was trying my best to nurture positive thoughts and the appropriate amount of anticipation ahead of the F.A. Cup Final. I will admit that I was genuinely struggling. For starters, there is no doubt whatsoever that the role of the F.A. Cup Final in the football calendar is at an all-time low. I have commented about the reasons for this on many occasions. Suffice to say, the accelerating importance of both the League and the Champions League, the huge amount of football games on TV these days, the playing of semi-finals at Wembley, the abolition of second replays, the playing of the Final itself before the league season itself has finished and the general mismanagement of The Cup by the Football Association over the years are the main reasons why we are in this current situation. This current state of affairs leaves fans of a certain age, like me, in a bit of a predicament. Those defeats still hurt to this day. So – anyway – you get the picture. Despite the elation of reaching another Wembley final, part of my psyche was labouring under the burden of the fact that things would never be the same as they were in those heady days of my youth. It was tough going, but I was trying my best to get my head around it all. To be honest, the fear of losing to Liverpool was helping to concentrate my addled mind. I was getting there. I could almost see the crescent of the Wembley Arch. And then Chelsea Football Club fcuked it up. They completely disrupted my thoughts on the Friday with the news that they (and I use the term “they” wisely) had officially bid for the site of the Battersea Power Station. Now then, I am yet to be totally persuaded that my club needs to vacate our home of 107 years, but that is not the point. The point is that the club announced this massive piece of news on the eve of The Cup Final. My Friday afternoon at work in Chippenham was spent thinking about the pros and cons of Hammersmith & Fulham over Wandsworth, Stamford Bridge over The Samsung Arena, North versus South, District Line over Northern Line, old versus new, home versus new home. To be honest, I was livid. But yet – how typical of Chelsea F.C. to misjudge the mood of the moment. The club, the fans and the team needed to be together ahead of the Cup Final with Liverpool, yet here they were – obviously still smarting from the CPO defeat in November – quite relishing the chance to bully a point across. Rather than focussing my mind on the game at Wembley, my mind was poisoned by the thought of myself attending the last ever game at Stamford Bridge in maybe six or seven years. Thankfully, when I awoke at around 6.30am on Cup Final Saturday, my mind was clearer and focussed on the day ahead. This was good news indeed. I took a while to decide what to wear; this is always a tough part of each match day for me…all those shirts, all those options…but even more so on Cup Final Day. I opted for the lime green of a Lacoste long-sleeved polo and the muted grey of a CP top. I knew that Parky would be similarly attired. The last time I wore a Chelsea shirt to a Cup Final was in 1994 when I wore – hoping for a repeat – a 1970 replica shirt. But more of 1994 later. And then my brain started whirring. “Just can’t get enough” – yep, that’s about right. I certainly can’t get enough of Chelsea. And then I remembered that Liverpool are one of the several teams who have purloined this song from under our noses and I wondered if I would rue my day beginning in this way. I remember the Scousers singing this at The Bridge in the autumn and I shuddered. A repeat at Wembley? No thanks. Parky – yellow Lacoste polo and grey Henri Lloyd top – was collected at just after 9am and we were on our way. I had pinned two Chelsea chequered flags to my car and I was keen to see if any other Chelsea cars were similarly attired as we drove up the M4. Surprisingly, on the drive east, we only saw two other Chelsea cars – and a Liverpool mini-bus. A car glided past and I spotted a bloke with an Arsenal replica shirt at the wheel. I smirked and he tried to ignore me. By the way, can anyone explain to me why that Arsenal vs. Norwich game could not have been played on the Sunday, along with all of the League fixtures? We were sharing the billing on just another football Saturday and it wasn’t right, damn it. We reached Chelsea at 11am and – for some reason – I wanted to drive past Stamford Bridge before parking up. In truth, the place was pretty quiet, save for Bob The T-Shirt’s stall already at work. I imagined the area being full of non-attendees come 5pm. We began with a quiet pint at “The Prince Of Wales” at West Brompton. There was drizzle outside as we caught the tube to Edgware Road. Nearing Notting Hill, however, Andy Wray sent me a text and advised that he was at “The Victoria” at Paddington. That was perfect timing and we quickly changed our plans. Several pubs in the Paddington area seemed to be overflowing with Liverpool fans. At just after 1pm, we met up with Andy, Ben, Dave Chidgey and a couple more Chelsea fans in the cosy confines of “The Victoria.” I spoke briefly to a Chelsea fan from Vancouver. Poor Ben was suffering with a hangover. I hoped he could recover quickly. Talk was of the new Battersea Stadium and of Munich. We then caught a cab to “The Duke Of York” where the lads were already enjoying a pre-match. The pub seemed quieter than for the semi-final and previous Cup Final visits. Ben commented that the main talk inside the boozer was still of Munich. Notable absentees were Simon, Milo and Daryl – all Munich-bound, and working on Brownie Points for the day. I chatted with Ben and Andy outside. The weather was mixed. I was glad I had my jacket with me. Talk was varied. Ben spoke about the Boston Blues and Andy spoke of The Olde Shippe. It was difficult to track my mood; to be truthful, I just wanted to get up to Wembley ahead of schedule and enjoy the moment. We soon pulled into Wembley Stadium and met up with a drunken band of Chelsea fans from Trowbridge, singing songs about slums and dead cats. The rain was holding off. It was a grey and decidedly dull day, though. Unfortunately, there was a horrendous delay at turnstile L at the western side of the stadium. I’m afraid to say that this caused me to miss – again! – the traditional Cup Final hymn “Abide With Me.” Our seats were in block 538, row 24. Up and up we went. Row 24 was the very back row. Seat 363 was just to the south side of the goal. In truth, we were only around 15 yards from our dead-central position at the 2010 Cup Final. OK, here we go. A quick scan. The Liverpool balcony was bedecked with red banners and easily out-did our end. Had somebody forgot to bring the eight to ten permanent banners at Stamford Bridge? There were small blue flags by each seat, but not many waved these. I had my cameras at the ready. I was annoyed with myself for missing the build-up, but at least I was in for the entrance of the teams. With the two teams lined up, the Liverpool fans were still bellowing out “You’ll Never Walk Alone.” I was worried that the old habits of the ‘seventies, when Cup Final teams often sung over the national anthem, might be resurrected. Oh dear, how correct I was. Were the boos by the Liverpool fans some sort of retaliation for the “Murderers” chants by some foolish Chelsea fans at the Spurs semi-final? Yes, for sure – but that only tells part of the story. Both Liverpool the city and Liverpool the football club see themselves as some sort of a free-spirited and anti-establishment utopia, railing against the perceived prejudices of the rest of England. They are pro-Liverpool, but anti-everything else. They are no big fans of the London government – especially a Conservative government which they still abhor for the Hillsborough aftermath, the London media, the FA. They evidently see the Royal Family as part of this picture. I have read that the Scousers were not happy that the Royal Family were not more supportive in 1989. And so it goes on. The over-whelming sense of ills being acted out against them. Into this mix comes Chelsea Football Club. The blue versus the red. The southern club with money but no history. The club with a history of right-wing support . The devil incarnate. Blue rag to a bull. This Cup Final was always going to be a tinderbox in the stands. Speaking personally, I did my best to ignore the “Murderers” chants by those around me and decided to support the team in as positive way as I could. This was my eighth cup final and it seems strange, knowing how dominant Liverpool were in my youth, that this was our first one against them. I had a further scan before kick-off and I was dismayed to see a few pockets of unused seats in our end. We had been given 25,000 seats for this game. I briefly thought back to that 1994 Cup Final when we lost 4-0 to Manchester United. We only received 17,000 for that game and yet I can well remember that we didn’t even have 17,000 members in those days. My dear friend Glenn wasn’t a member that season, but had applied for his 1994-1995 membership early. As a result, his name was put into a raffle for the last few Chelsea tickets and was overjoyed when Chelsea called him on the ‘phone to say he had been successful. It made me realise how far we have come in eighteen years. Less than 17,000 members in 1994. More than 25,000 season ticket holders in 2012. What will we be in 2030? Or – more pertinently – where will we be? Maybe there is some sanity in Chelsea’s desire to move out of Stamford Bridge. I put these worrying thoughts to one side as I turned my complete attention to the 2012 F.A. Cup Final. There were no surprises in the Chelsea line-up; Didier was leading the line, ready to add to his phenomenal haul of goals under the arch. I was surprised to see Craig Bellamy in the Liverpool team ahead of Andy Carroll. Chelsea dominated possession in the first part of the game. This did not surprise me. If we were underdogs for Munich, surely we were the slight favourites for this one? We were the team in form, whereas Liverpool were floundering several places below us in the league table. We did not have to wait long for a goal. Juan Mata was allowed time and space in the centre of the pitch and played a magnificent ball into the path of the advancing Ramires. It was eerily similar to Camp Nou. This time, there was no chip, but a low drive at Reina’s goal. Before we knew it, we were 1-0 up and the Chelsea end erupted. I was shouting like a loon, but steadied myself to capture a few of the celebrations away down below. Soon after, Ivanovic did well to block a Bellamy effort which was certainly goal bound. This was a cagey game, though, with few chances. A fine dribble by Salomon Kalou deep in to enemy territory petered out. Long shots from Frank Lampard, Didier Drogba and Kalou did not worry Reina. We rarely looked in danger, though, and I was very content to see that Luiz Suarez was having a quiet game. Downing and Bellamy were buzzing around, but our defence was in control. In the middle, our trio of Mikel, Lamps and Ramires were covering space and not allowing Gerrard much time to impose himself on the game. The atmosphere was hardly noisy. It all seemed a little too easy. The Liverpool fans were not singing too loudly either. There was a strange feeling to the evening. At half-time, our intelligence was insulted with a feeble attempt at entertainment and I won’t even bother explaining it. As the teams re-entered the pitch, the Liverpool fans held their scarves aloft and sang “You’ll Never Walk Alone” but even that felt half-hearted. Parky had disappeared for a beer at the break, but hadn’t made it back. The second-half began with a couple of chances for both teams. Kalou set up Ashley Cole but his shot was blocked. There was ludicrous penalty appeal by Gerrard. However, right after, a fantastic move had us all buzzing. Jon Obi Mikel played in Frank Lampard and he, in turn, slotted in a slide-rule pass into Drogba. He found himself in roughly the same area as against Arsenal in the semi of 2009 and Spurs in the semi in April. A touch, a shot, a goal. The ball was slotted in with fantastic precision at the hapless Reina’s far post and we erupted once more. Didier has done it again. He raced over to the far corner and I again steadied myself for snaps. His little victory jig was magnificent. Oh, how he loves playing at Wembley. Four goals in four Cup Finals. Phenominal. Parky finally re-appeared, having been drinking a beer with Whitey when Didier’s goal had given us a hopefully unassailable lead. He didn’t look sheepish, he didn’t care. Good old Parky. Another strong dribble from Kalou, but he shot over. A Lampard free-kick. This was all Chelsea and I was silently dreaming of more goals. Juan Mata set up Didier but he only hit the side-netting. The Chelsea choir was now in full voice. How it must have hurt the Liverpool legions to hear songs of European Cup Finals. It was the loudest Chelsea chant I have heard at new Wembley. And then the game changed. Bosingwa lost the ball and Downing fed the ball in to Andy Carroll, the Liverpool substitute. Carroll twisted John Terry one way and then the other before rifling the ball high past Petr Cech. The red East end roared. The last thirty minutes seemed to be all Liverpool. Steven Gerrard, previously marginal, was seeing much more of the ball and Carroll looked a threat. Petr Cech did ever so well to get down low to turn a Suarez shot past the post. Raul Meireles took the place of the tiring Ramires. Then Dirk Kuyt replaced Bellamy. The last throws of the dice. The final fifteen minutes. Our celebrations were proving to be overly optimistic and premature. This was now an intensely nervous affair. Liverpool moved the ball around and we were shuffling around to repel their advances. In a way, it was Camp Nou all over again, with di Matteo’s Italian heritage putting us in good stead to quash any attacks. On 81 minutes, Liverpool had a spare man out on the right and a great cross found the head of Carroll. I expected the equaliser. In a sudden blur of activity, we saw the header parried by a falling Cech, but we heard a roar and the subsequent run of Carroll away from the goal, celebrating again. The linesman was running away from the goal-line, his flag low. I was confused; was it a goal? Was it blocked? If it wasn’t a goal, how did it happen? It wasn’t a goal. It was a miracle. Another Chelsea miracle. How we love that East goal at Wembley. After the Juan Mata goal versus Tottenham, the Cech save against the Scousers. Football is indeed a matter of inches. In the final moments, Liverpool shots were either off target or bravely blocked by Chelsea defenders. It was indeed Camp Nou Mark Two. I couldn’t enjoy this though. Just like in 1973, when I sat on my grandfather’s lap watching Leeds United attack Sunderland’s goal again and again, I was clock-watching like never before. We got to 89 minutes…just like Liverpool to score then, Hillsborough and all. Five minutes of extra time. Still we chased and defended bravely. At last – I watched as Phil Dowd held his whistle to his lips and blew. Chelsea F.C. – 2012 F.A. Cup Winners. 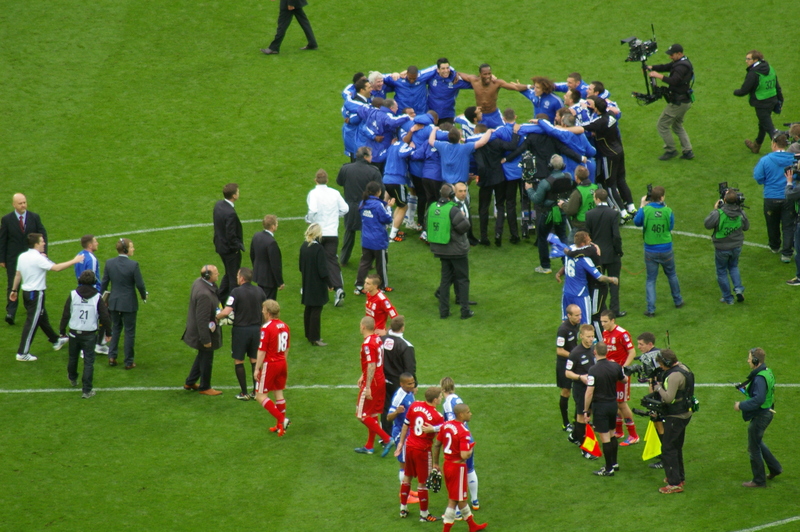 The Liverpool players looked on as Chelsea gathered together in their half and performed a “Ring Of Roses” dance. Around me, there were smiles. Parky was in tears. The Chelsea players slowly came towards us. Didier, shirtless, led the slow advance but was soon joined by his cavorting team mates. I was relieved and happy. This was Chelsea’s seventh F.A. Cup success. The first one, in 1970, was probably the reason why I became a Chelsea fan, though the real reasons are lost in time. I have been present at all six other wins. We love Wembley and we love this cup. The Liverpool players climbed the stairs, but most of their fans had left. How proud I was to see that line of players in royal blue slowly ascend the steps, then disappear from view…tantalisingly…then arrive on the balcony. The cup was lifted and we roared again. Very soon, “Blue Is The Colour” boomed around the echoing Wembley arena. In the last closing bars of the song, I looked up at the scoreboard at the opposite end of the stadium. Just as Ossie, Chopper and co were singing “Cus Chelsea, Chelsea Is Our Name”, the cameraman picked out a young Chelsea fan. He reminded me of me, circa 1972. Now it was my turn to wipe away the tears. Down below me, we were in party mode. It was gorgeous. The champagne, the dancing, the smiles, the joy…the small details. David Luiz hogging the cup as if it was his own. Juan Mata grabbing Fernando Torres’ arm and hoisting it up, Torres looking bashful and embarrassed. John Terry beating his chest. The cup looking larger than usual and glinting like never before. Parky and I were one of the very last to leave the stadium. I was tired and emotionally drained. I had been stood outside the pub, on the train, at the game, my feet were on fire. We met up with Cathy and showed each other a few photos from the day. She had been right down the front, I had been right down the back. In between the two of us, thousands of Chelsea fans, thousands of memories. I spotted Andy and Ben. What stories they would have to tell their friends back home. I commented that we would be running the gauntlet at Anfield on Tuesday night. We caught the last train out of Wembley Park at 8.30pm with the arch behind us now, lit from below and looking magnificent. At last I could sit. I was so tired, so drained, but so happy. A Liverpool fan from work sent me a text containing a few words of congratulations, saying that the best team had won, but debated that the Cech save was really a goal. My reply to him? We made our way through central London and alighted at Earls Court. A few minutes later, we were welcomed at “Salvo’s” and were soon toasting Chelsea Football Club on another miraculous victory in this ridiculous season. Salvo mentioned that Roberto di Matteo, visiting with his blind sister back in 1996, once enjoyed a meal at his little restaurant. I reckon that Salvo should erect a plaque – a nice bug blue one – above the entrance to “Dall’Artista”to signify this. You love me like you do. A few minutes later on the elevated section of the M4, I couldn’t resist a glance to the north. And there it was – the Wembley arch, illuminated still, signalling the location of our most recent triumph. Liverpool vs. Chelsea : 7 November 2010. My sporting weekend began on Friday evening when San Francisco Bob, Lord Parky and I visited a local pub to see Ron Harris and Charlie Cooke, who were in the middle of a spate of appearances all over the United Kingdom. We had a great time. I have heard most of Ron’s stories from his playing days before, but it was refreshing to listen to Charlie’s tales from Scotland, England and America. I especially enjoyed Charlie’s reminiscences of playing amongst Docherty’s Diamonds. Tommy Doc was quite a character and I think there was a certain kinship between player and manager since they both came from hard-nosed working class areas in Scotland; Cooke, a Protestant, from Greenock on the banks of the Clyde and Docherty, a Catholic, from the bleakest of inner city areas of all, The Gorbals. We were whooping with laughter at the stories about Peter Osgood, Tommy Smith, Peter Bonetti and Bobby Charlton. On the Saturday, Bob and I watched local Zamaretto League team Frome Town play Clevedon Town. My two friends from school days Steve and Francis were at the game too and it made a nice change. Steve was a big Bristol City fan as a youth and it is ironic that his eldest son Harry is now banging in the goals for one of Bristol Rovers’ academy teams. Frome came from 0-1 down to nab an unlikely 2-1 win with a goal in the very last minute. However, my elation was short-lived when Bob told me that Manchester United had also scored a last minute winner. Bloody Hell. On the Sunday, it was Chelsea’s turn to play. So, at last, a game in the North West without me at the wheel. I sat back and relaxed as Mark made good time. I first met Mark on that fateful day in April 1984 when we beat Dirty Leeds 5-0 and won promotion to the top flight. We reminisced about that day plus a few others from around that time. Parky and Mark’s mate Les phoned and asked about tickets for the Birmingham away game. This elicited a funny story from Lord Parky. Many years ago, Les used to work as a butcher in the Trowbridge firm of “Bowyers.” On one Saturday morning, Les did a morning shift and didn’t have time to get changed from his white butcher’s overalls. He drove Parky and a few other Trowbridge ruffians up to Chelsea in his car and parked up close to the ground. As a master butcher, he always kept his set of expensive knives in the car boot. As he hurriedly parked his car, his all-white tunic attracted the attention of a passing policeman, who was further taken aback when he glimpsed Les’ set of sparkling knives in the car boot. “What’s going on here? What are you doing?” the copper asked of Les as the butcher’s robes were being discarded. “Sorry, what do you mean? I’m getting out of my work clothes” replied Les, sensing the chance of some laughter. “Why, what do you do?” the policeman asked. I posed my favourite question about which football stadia can be seen within five minutes of each other in the Birmingham area and Kerry answered correctly. Incidentally, guess who Kerry is named after? Too easy, eh? Alan and Gary were on their way north on the Chelsea train and Burger and Julie were Liverpool-bound too. We shot past my former stomping ground of Stoke-On-Trent and Parky opened another lager. Bob was taking it all in, with his excitement rising as each exit on the M6 was passed. This was to be Bob and Kerry’s first visit to the fields of Anfield Road, while Mark’s last visit was in 2002. I think Parky’s last visit was back in the ‘eighties. We flew over the Thirlwall Viaduct and then off at exit 23. Mark now had Liverpool in his sights and the chat got quicker and more intense. To be truthful, Mark didn’t have a clue what they had said since it sounded more like “Washyercamate?”, that nasal Scouse accent to the fore. We ignored them and walked on by. We walked through the Stanley Park cemetery, then out onto Utting Avenue. A chap dressed in an army uniform was playing “The Fields Of Athenry” on the bagpipes as we headed up the hill and another soldier had a bucket collecting for Remembrance Day. Our jackets were protecting us from the cold. We skipped past The Arkles as it looked too busy. Instead, we made our way to The Flat Iron. Pints were purchased and we made our way into the lounge bar just as “Going Underground” by The Jam started on the pub juke-box. How appropriate I thought. Going underground, going behind enemy lines, going undercover. We stayed there for about an hour, a little gaggle of Chelsea in one corner, surrounded by Scousers all around us. A lad called Andy joined us and it turned out that Andy has the fortune of sitting next to Parky in the Shed Lower. Small world, eh? We were then joined by Julie and Burger, then Cathy and Dog. I was still struggling with the remnants of my hangover, so regrettably didn’t join in further rounds. My mate Francis, a Liverpool fan, texted me to say that Essien wasn’t playing. As we headed towards the back of The Kop on Walton Breck Road, we passed five or six Scousers sitting on a low red brick wall. They were sporting tight dark jeans with old school Puma and Adidas trainers, like throwbacks to that golden era of Scallydom in the late ‘seventies. We soon found ourselves right underneath the red brick and grey roof supports of The Kop. Touts were looking for business, street traders were grafting away and there was the usual mix of sounds and smells of matchdays…those impenetrable thick Scouse accents, the shouts of fans, the smell of chips, the noise, the tribal routines and the anticipation. We then edged around towards the away stand and walked through the Shankly Gates, erected soon after the passing of Bill Shankly in 1981. The gates were forged in my home town of Frome, strangely enough. We momentarily stood by the Hillsborough Memorial and I noted quite a few Scousers touching the black granite with 96 names etched in gold. I bought a copy of “CFCUK” and there was an obituary by Beth for her beloved friend Simon Turner. We heard another rumour that Drogba was on the bench. A few “hello mates” to the usual suspects as I made my way to my seat, right behind the Annie Road goal. Such a familiar view these days – this would be my seventeenth visit to Anfield, probably more than a lot of Liverpool fans. Bob and Kelly were sat just five rows behind us. Unfortunately, the pre-match rumours were true. Not only no Frank Lampard, but no Michael Essien and no Didier Drogba. The midfield three looked particularly second rate. A big game for Nico upfront. In the match programme, I loved seeing five or six black and white photographs from a Chelsea vs. Liverpool game from March 1978. I saw the game with my parents in the East Lower and we beat the reigning European champions 3-1 after going a goal down. Fantastic memories. Our goals were scored by the stalwarts from the America Tour of 2009, those likely lads Steve Finnieston and Tommy Langley. Tommy rates his first goal from that game as his best ever Chelsea strike. Gerry and The Pacemakers did their usual turn and thousands of red and white scarves were held aloft. It seems hard to believe these days, but back in the ‘seventies and early ‘eighties, “YNWA” was not restricted to the terraces of Anfield. Back in those days, a lot of clubs used to mimic The Koppites. The Shed often used to sing “YNWA” and blue and white scarves were held overhead. Strange, but true. We kicked-off and kept possession for 63 seconds. I think this was our best spell of that first-half. Joking aside, we were bloody awful. Liverpool chased us down at every opportunity and we had no time on the ball. Of course, Torres pounced on about ten minutes to outwit a tangled John Terry and neatly finish with a clipped flick to the far post. Seeing the net bulge made me feel ill. The home support roared and Torres reeled away. A sickening feeling. I just stared at the celebrating home fans and it hurt. Soon after, an Ashley Cole cross found Salomon Kalou who forced a great save from Pepe Reina. However, apart from a couple of long shots, I can’t remember any other Chelsea chances in that arid first period. I thought Mikel was solid, but Zhirkov and Ramires were sadly deficient. They were neither defending well, nor breaking forward in support of the stranded Anelka. I hadn’t seen a more insipid Chelsea midfield for quite a while. The one high spot of the half was watching Alex go up a gear to effortlessly beat Torres in a beautiful sprint for a loose ball. He was like a middle-distance runner turning it on during the last 100 metres of a race. Then of course, a slip by Ashley and the ball was splayed wide to Torres. I immediately sensed danger. Ivanovic should have forced him outside, but gave him too much room. Torres advanced, dropped a shoulder and craftily curled the ball past a stranded Cech and into the goal. The net bulged again and the Scousers roared even loader. Oh God. It pains me to say that the two Torres goals were of exceptional quality. Long faces at half time. I said to Gary “I can’t see us getting back into this, mate. In fact, I can see us conceding more.” I wanted a big team talk from Carlo at half-time. He’d have to change things. Bringing on Drogba was a no-brainer. The second-half was, of course, much better. However, could we really have played any worse? We enjoyed a lot more of the ball. On 59 minutes, Ramires rose and headed over from a Cole cross and this stirred the away support. We had been standing all game and we never stopped cheering the lads on. As we got more and more into the game, the Scousers quietened down. This was a lot better and we urged the team forward. I was thoroughly enthralled in the game – though it never felt like we would get the goals back. However, I was kicking every ball, heading every cross, sliding in with every tackle. “At least it’s a job!” retorted Alan. One thing annoyed me. Drogba was tackled but was not given a free-kick. With rising anger, I watched him slowly get up – with a Chelsea attack developing around him – and slowly walk twenty yards towards the penalty area, oblivious to the play to his left. At one stage, the ball was played to him and he was facing the wrong way. Groin strain or no groin strain, this sort of behaviour is not wanted at Chelsea Football Club. However, I suddenly realised that Liverpool had hardly touched the ball during the previous fifteen minutes. A great show of strength from Drogba – at last! – and a ball was slammed into Malouda, but his shot was saved at point blank range by Reina. We groaned like never before. Despite good wing play from substitute Bosingwa and the lively Ashley Cole, we didn’t carve out many real chances. John Terry often raced forward to support the attack, but Liverpool defended resolutely. Carlo made some changes and Sturridge had a couple of half chances. I couldn’t believe that Ramires wasn’t substituted, though. The game passed him by completely. I was really pleased that hardly anybody amongst the 3,000 Chelsea loyalists left before the end of the game. We stayed with it. We all knew how important this game was. Anelka hit the bar from close in with five minutes to go and the ball spun back into the lucky Reina’s arms. We just knew it wasn’t to be our day. Where was The Flying Pig when we needed him? We had the predictable post-mortem…why didn’t Didier start, why were Yuri and Ramires so poor, how did we give Liverpool so much space? I felt tired and, for once, I was able to get some sleep…a rare luxury for me on Chelsea match day journeys. By the time we had stopped at Stafford for some refreshments, the mood had lightened a little. I commented to Mark that we ought to put this into perspective. We were depressed after an awful first-half, but there are thousands of football fans who travel the congested roads of England and Wales in support of their teams and, for many, there is no end to the agony, no end to the run of defeats, no cash, no future, no light at the end of the tunnel. Only the friendships of fellow fans to get them through the murky gloom. Back in the car, Parky opened up another can. “Are we there yet, Mark?” I asked. Parky was shoved out of the car at 10pm…”see you on Wednesday, mate.” Goodbyes to Mark and Kerry at Westbury and a goodbye to The Bobster in Frome. It had been a bad day at the office, but we have two winnable home games coming up. Let’s regroup and go again.